PetroChina has announced that a first batch of crude oil has been successfully piped from Kazakhstan to its oil tank field in northwestern Xinjiang Uygur Autonomous Region via the China-Kazakhstan Pipeline. The oil reached the refinery at 5 p.m. Saturday. The arrival of the first crude oil imports signals full commercial operation for China's first cross-country crude oil pipeline, said a circular released by PetroChina. The transnational section of the crude oil pipeline linking China to Kazakhstan is 962 km long. It joins a 246 km domestic section, making a total length of more than 1200 kilometers. 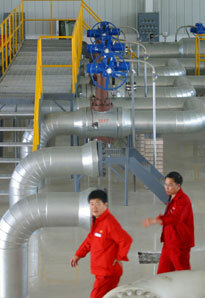 The pipeline, which can carry 10 million tons of crude oil per year, starts at Atasu in west Kazakhstan. It enters China at Alashankou port on the Sino-Kazakhstan border before reaching its destination at PetroChina Dushanzi Petrochemical Company. Jointly built by China National Petroleum Corporation, China's largest oil producer and the parent company of PetroChina, and construction companies from Kazakhstan, the pipeline will strengthen China's oil supply security by offering a land route. It will also give China better access to oil in both Kazakhstan and Russia, according to analysts. Kazmunaigaz and it is designed to transmit 20 million tons of oil a year, 15 percent of China's total crude oil imports for 2005. The first phase of the pipeline will transmit 10 million tons of oil a year, a figure that will double when the entire project is completed in 2011. The total length of the pipeline would then be around 3,000 kilometers. China has set up an oil meterage station at the Alataw Pass, from where the crude oil from Kazakhstan enters China. Industry insiders say construction of the oil pipeline is a win-win strategy for both countries as it will hopefully ease China's energy dearth and provide an ideal destination market for Kazakhstan's rich oil resources. Kazakhstan's crude oil output topped 50 million tons in 2002, the most recent time that data is available from here, and about 70 percent of its oil is exported. With huge reserves in the Caspian Sea, insiders say the country's oil output will top 100 million tons by 2015. Last year, China's crude oil import totaled 127 million tons, about 40 percent of its total consumption. About a half of China's oil import came from the Middle East and only 1.3 million tons was imported from Kazakhstan, via Alataw Pass, in 2005. Insiders predict that the figure will climb to 4.75 million tons this year and to around 8 million tons in 2007. China and Kazakhstan started energy cooperation in 1997, marked by an intergovernmental agreement covering diverse means of collaboration in oil and gas fields, including an oil pipeline between western Kazakhstan and China's Xinjiang.